The Importance of Being Earnest is a comedy with so many witticisms and socially wry observations, that we are spoilt for choice. In Peter Gill's charming production, which originated at the Theatre Royal in Bath, Wilde's humour comes to the fore. I remember a few years ago Peter Brook describing with sorrow that so many of Shakespeare's best lines had turned to clichés. So it is with Wilde's epigrams. The lines are so well known that it is impossible for them not to stand out of their context as if they had been highlighted with a neon felt tip pen. It must make it especially difficult for the actors to speak them naturally and without overdue emphasis but Peter Gill has ensured that the comedy is played at a rattling good speed. The handbag line was delivered quietly and in a matter of fact way so as to get as far away as possible from Edith Evans' famous expression of disgust and censure. In fact Penelope Keith's Lady Bracknell isn't really a dragon at all, she is quite kindly in her early scenes. The Chinoiserie of the London drawing room decor and furniture is sumptuous and very detailed and the costumes are simply gorgeous. William Dudley's other two sets are very pleasing but don't quite live up to the promise of the first. The two handsome young men in their tailed frock coats, Harry Hadden-Paton as Jack Worthing and William Ellis as Algernon Moncrieff are well cast and not dissimilar physically. They could be related! They are superficial but immensely likeable young men in this lightest, least socially biting and caustic of the Wilde comedies. Their girls are lovely. Daisy Haggard vamps it up shamelessly as Gwendolen with her divine Victorian, off the face hat piled up with frippery. Rebecca Night is Jack's ward Cecily and the two "gels" swear to be best friends, switch to mortal enemies and back to best friends in the space of a few minutes with the delightful inconsistency of women changing their mind. The wonderful Janet Henfrey is a long faced Miss Prism who has carried the terrible burden of losing a baby all those years ago. I wonder what the outcome would have been if the foundling baby had been brought up in a Victorian workhouse instead of being adopted into a wealthy, propertied and well-connected family? 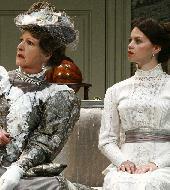 Janet Henfrey's facial expression as she owns up to Lady Bracknell is exquisite. Penelope Keith is well known to television viewers in the UK for her roles as posh women in situation comedies like To The Manor Born and The Good Life. As I have mentioned she is less formidable and therefore less of an obstacle to the course of true love but she looks gracious and is beautifully turned out and, thank goodness, all four lovers are eventually found to be matched for money and social status. Tim Wylton gives some comedic steps to liven up his role as the Reverend Doctor Chasuble, the vicar suitor of Miss Prism,. Wilde's comedy stands the test of time. The wit and charm need no translation and it is a lovely evening in the Vaudeville Theatre expertly directed by Peter Gill.